Glamour Photographer Rolando Gomez recently wrote about using a simple white balance technique he used on his photoblog www.lensdiaries.com to add vibrant color to the ocean and sky in the background of his imagery. By white balancing the camera and light source to a specific color, anything illuminated in that color will appear normal while the rest of the shot will become saturated in the complementary color. 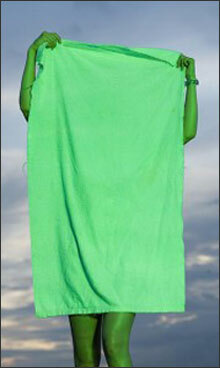 American Idol's Amy Davis is illuminated by a studio flash covered with a Rosco Green CalColor Gel. White Balanced To Green. For example, to achieve the vivid magenta background achieved in this Rolando Gomez image, the camera is white balanced to the green light created with Rosco gels placed on Rolando's flash. The green gel remains on the flash during the photo session so that the subject appears normal and everything else, in this case the sky & water in the background, has a brilliant magenta cast. Because magenta is the opposite color of green in the spectrum, the camera, when custom white balanced to green, will add the complementary magenta color to anything not illuminated by the green flash. This technique applies to anyone shooting with a digital camera that has custom white balancing capabilities, including: SLR, HDSLR, Video and HD Video. 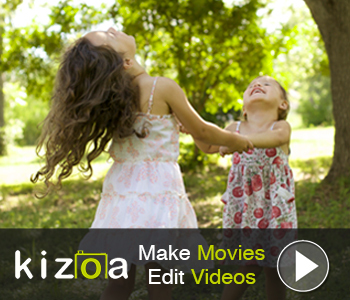 Having the power to change the color of the sky and background in the camera before capturing the shot saves countless hours of postproduction. The key is choosing a color filter for the subject lighting whose complementary color is what the photographer wants the background to be. The filters need to be pure primary and secondary colors to give the photographer an objective way to white balance to a pure color and, if need be, tweak the colors from there. 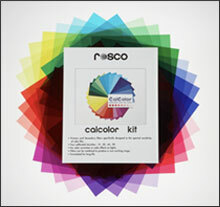 Rosco's Academy Award®-winning CalColor filters fit the need perfectly. They are calibrated in precise gradations of primary (Red, Green and Blue) and secondary (Cyan, Yellow and Magenta) colors and are available in rolls, sheets and an inexpensive 10"x12" kit. As Rolando Gomez's photos show, the color of the background is yours to command, the key to successfully using this technique is the color filter used on the light and Rosco CalColor filters are the place to begin. Custom White Balanced To Cyan. Rolando Gomez is a famed glamour photographer and author of five books on the subject. Gomez is also a popular seminar leader, having conducted almost 500 photography workshops over the past 12 years. For other photography tips and techniques from Rolando, visit www.lensdiaries.com.